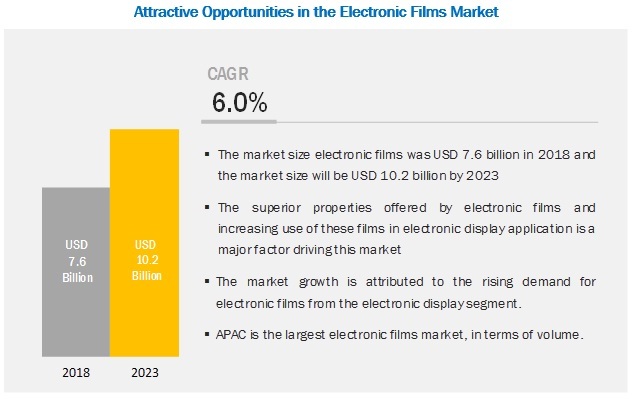 [121 Pages Report] The electronic films market is projected to grow from USD 7.6 billion in 2018 to USD 10.2 billion by 2023, at a CAGR of 6.0% during the forecast period. The study involved four major activities in estimating the current market size for electronic films. Exhaustive secondary research was done to collect information on the market, the peer market, and parent market. The next step was to validate these findings, assumptions, and sizing with industry experts across the value chain through primary research. Both top-down and bottom-up approaches were employed to estimate the complete market size. Thereafter, market breakdown and data triangulation procedures were used to estimate the size of market segments and subsegments. In the secondary research process, various secondary sources such as Hoovers, Bloomberg, Industrial Film Association, and BusinessWeek were referred to, so as to identify and collect information for this study. These secondary sources included annual reports, press releases & investor presentations of companies, white papers, certified publications, articles by recognized authors, gold standard & silver standard websites, food safety organizations, regulatory bodies, trade directories, and databases. The electronic films market comprises several stakeholders such as raw material suppliers, processors, end-product manufacturers, and regulatory organizations in the supply chain. The demand side of this market is characterized by the development of the electronics industry and the rise in consumer demand. The supply side is characterized by advancements in technology and diverse applications. Various primary sources from both the supply and demand sides of the market were interviewed to obtain qualitative and quantitative information. After arriving at the overall market size using the market size estimation processes as explained above, the market was split into several segments and subsegments. In order to complete the overall market engineering process and arrive at the exact statistics of each market segment and subsegment, the data triangulation and market breakdown procedures were employed, wherever applicable. The data was triangulated by studying various factors and trends from both demand and supply sides in the electronics industry. This research report categorizes the electronic films market based on film type, material type, application, and region. 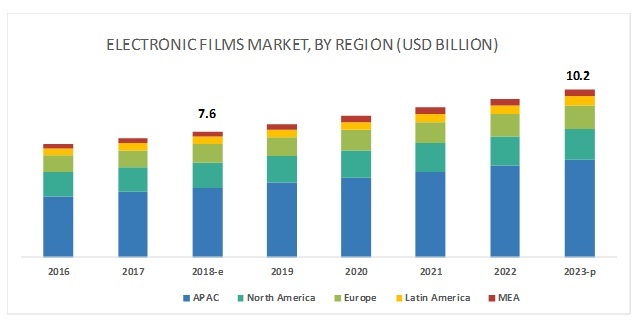 The electronic films market is projected to grow from USD 7.6 billion in 2018 to USD 10.2 billion by 2023, at a CAGR of 6.0% during the forecast period. The market is growing due to the high demand for electronic displays from smartphones, tablets, and other similar consumer electronic devices. Electronic films are used in this application as they exhibit properties such as chemical resistance, high-temperature tolerance, low coefficient of friction, optical transparency, conductivity, UV & weather resistance, moisture resistance, high insulation, low surface energy, and low dielectric constant. By film type, the non-conductive film type is expected to have the largest demand during the forecast period. Electronic films are in two types – non-conductive and conductive. The non-conductive film segment is expected to lead the electronic films market during the forecast period. These films are known for their significant physical properties such as high-temperature tolerance, low coefficient of friction, chemical inertness, weather/UV resistance, and negligible moisture absorption. 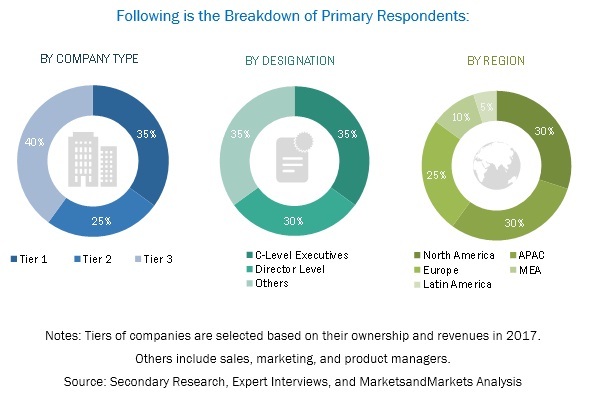 High demand for non-conductive films from electronic display, PCBs, and semiconductor manufacturers is driving its market. The roll out of 5G in China by 2020 and adoption of digital signage will boost the demand for PCBs and electronic display. By material type, polymer is extimated to be the largest material type segment of the electronic films market in 2018. Electronic display is projected to be the largest application of electronic films during the forecast period. Electronic films are used in electronic display, PCBs, semiconductors, and other applications. They are majorly used in the electronic display application. There is a rising preference for large screen size LCDs in residential and commercial destinations. Large screen size LCDs have a larger surface area, and this leads to higher consumption of electronic films. Digital signage uses technologies such as LCD and LED in public spaces, stadiums, retail stores, hotels, and restaurants. The demand for digital signage is increasing due to the flourishing retail industry. Furthermore, over the past few years, display technology has undergone radical changes, which has led to the increased adoption of OLED (organic light emitting diode), QDLED (quantum dot light emitting diode), and EPD (electronic paper display) technologies. APAC is expected to lead the electronic films market during the forecast period. APAC is a key electronic films market. Majority of the electronic films manufacturers across the region are constantly involved in product innovations. The manufacturers are adopting various growth strategies to strengthen their position in the market. The electronic films market comprises major solution providers, such as DowDuPont (US), Toray Industries Inc. (Japan), Gunze (Japan), Nitto Denko Corporation (Japan), Saint-Gobain S.A. (France), The Chemours Company (US), Toyobo Co, Ltd. (Japan), Teijin Ltd. (Japan), TDK Corporation (Japan), and 3M (US). The study includes an in-depth competitive analysis of these key players in the electronic films market, with their company profiles, recent developments, and key market strategies. DowDuPont is one of the prominent players in the electronic films market. The company has a strong focus on R&D to increase its technology-driven product portfolio. As a part of its growth strategy, the company is highly focused on new product developments and expansions. For instance, in May 2018, the company increased the production capacity of its Kapton polyimide film by up to 20%. This helped the company to meet the high demand for Kapton polyimide film for Interconnect Solutions of the DuPont Electronics & Imaging segment. In May 2018, DowDuPont (US) increased the production capacity of its Kapton polyimide film by up to 20%. This helped the company to meet the high demand for Kapton polyimide film for Interconnect Solutions of the DuPont Electronics & Imaging segment. In April 2017, Saint-Gobain S.A. (France) launched ultra-wide-web coater for reactive sputtering at its manufacturing facility in San Diego, California. It is a technique for depositing thin layers of metals, ceramics, and oxides on to films. This will help the company to enhance NORFILM’s capability to deliver high-quality and highly engineered products to customers. In June 2016, Nitto Denko Corporation (Japan) acquired the functional film business used for automotive side curtain airbags from Nolax Holding (Switzerland). With this acquisition, the company expanded its product portfolio to cater to the automotive and transportation industries effectively. Which are the major applications of electronic films? Which application is the major consumer of electronic films? Which region is the largest and fastest-growing market for electronic films? Which material is mostly used in conductive films? 10.11.5 Oike & Co. Ltd.